The latest pair (which has overtaken the pair before) is unfinished, but I want to document progress on it, so here goes. The last time I showed it here, it was just starting on its cuff, though there's a later shot of the cuff about as long as the brown one above. At that time, the plan was for a multi-colored sock with, perhaps, some solid stripes on the foot. However, by the time I was three inches down on the first cuff, and an inch down on the second, I realized that the two balls of Mountain Colors Bitterroot Rainbow were not quite the same--one was distinctly darker and duller than the other. Pause for thought. One brighter and one duller sock? No. One brighter cuff and one duller cuff? No. The plan became "knit the second cuff to the same length as the first cuff, then switch balls of yarn to finish off, and make the cuff an extra inch longer. Then use a solid color for the ankle, knit the heel flap in the MC yarn, whichever one was used for the lower part of the cuff. After looking at the effect that made, consider how best to join up the rounds (using the same solid color as the ankle? Using the same multi as the heel flap?) and then stripe the foot in alternate multi and solid yarn, perhaps (one idea) using the same solid color throughout or (other idea) use other colors in the multi yarn (it has purple, blue, green, yellow, orange, and red) down the foot, and both ideas) alternate the multi stripes between the two balls of yarn-- to achieve a "fraternal twins" pair of socks. 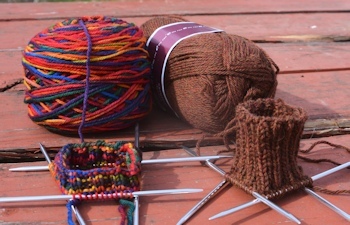 Right now, February 25, I've turned the heels of both socks (repairing solidly, though not perfectly, a dropped stitch in the eye-of-partridge heel pattern on one) and have picked up the stitches on one. Picking up the stitches turns out to be much easier when all those edge stitches are different in color from the ones on either side. The solid color is Ella rae Classic #85, navy blue; I'm still thinking whether to use it throughout, or add some purple, green, red, and a sort orange-yellow I have in the stash. The toes will be multi-colored, possibly with a one-row stripe of the navy. I saw in an article posted on facebook a discussion of the Vikings and what they wore and what they used for their sails. Apparently they wore mostly wool. And the kicker is that their sails were made of wool - coated with a bunch of locally available stuff. Apparently it took the wool of 1000 sheep for one sail - so that a Viking fleet would need hundred of thousands of sheep. All I have is severall LL Bean woolen shirts and a fine Pendelton blanket for my bed. Times have changed. temperature was up to 60 here in New Hampshire. Thanks again for the Paks books - they make me think. I found that article (or possibly the original--in a history magazine) via Twitter. Great, wasn't it? I had read before that they used woolen sails but had wondered how on earth--imagining a lot of soggy wool blankets that wouldn't catch the wind well but would be heavy and drip on the rowers. The multi yarn is cheering to work with. 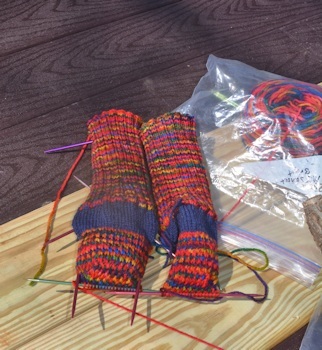 Mountain Colors yarns feel great in the hand, are easy to work with for the most part.